Congratulations! Your artwork has been selected for National Juried Competition: Works on Paper 2017 by Juror Jane Panetta, Associate Curator, the Whitney Museum of American Art. The Long Beach Island Foundation of the Arts and Sciences is pleased to invite you to participate in this year’s exhibition. The competition attracted 400 applicants with more than 1,250 works of art, making the selection process a very difficult one. ​The LBIF was established in 1948 as a non-profit institution by sculptor Boris Blai to provide arts and educational opportunities to Long Beach Island and the surrounding communities. Blai, who studied under Rodin and was the first Dean of Tyler School of Art, Temple University, felt that through exceptional exhibitions, art classes, and cultural activities, the LBIF could provide visitors and residents with opportunities to share and experience quality arts and cultural programming to enrich their lives. The LBIF has had a lasting commitment to serving professional artists and introducing exciting artwork to its wide and diverse audience. The LBIF attracts thousands of visitors from New York, Connecticut, Pennsylvania, and Maryland as well as New Jersey, offering exhibitions, visiting artist classes, an artist residency and retreat program, and a variety of other programs that bring contemporary artists to its thirteen studios and galleries. Our 2,689 sq. foot gallery houses our featured exhibitions throughout the year. We know that this exhibition will continue the tradition of excellence and we look forward to sharing your work with our visitors. It was during the early 1980’s, while painting in Edinburgh, that Marge Moody began experimenting with abstraction. Observing the reflecting of the garden on the greenhouse glass from her adjacent studio, she considered alternate ways to represent the motif. About the same time, exhibitions in London of Kurt Schwitters’ collages and of George Braque‘s cubist paintings provided other sources of inspiration. For an artist like Moody, so well trained in design principles, the challenge was to maintain compositional integrity and at the same time to truthfully describe the interaction between the artist and the motif. From that time onwards, Moody has continued to explore the possibilities of collage and abstraction. Because collage elements usually derive from ordinary items populating our daily space, Moody’s sensitivity to the colors, shapes, textures configurations that surround her is particularly rich. Factor in that she has lived in such dissimilar places as Kenya, the northern UK and now the southeastern United States, so that each distinctive environment has only sharpened her awareness of life’s daily ingredients. Among her recent work is the Italy series -- paintings and collages birthed by her travels in Italy. Across each canvas, Moody probes and intuits the sights, sounds, movement, emotions, which she associates with the motif -- a drive through a rainy landscape, an open air market. Working in a language of abstraction, Moody’s self-expression merges with a commitment to sheer formal congruency. Though these pieces are non-objective, their composition, title and occasional subject references coalesce into imagery, suggestive of narrative. Here the color, line, shape, texture and space broadly narrate the lived experience of the artist. Consciously and subconsciously, Moody registers feelings, impressions, memories, as she builds her design. A strong principle of contrast girds her compositions. It is this dynamic of contrast that adds the breadth and depth of the lived experience. In the painting, San Clemente, the variety of the visual contrast delivers life’s organic appeal. Moody dramatically counters the convex with concave; the volumetric with the linear; the cool heats up the warm. Swinging out towards the viewer in a generous arc is the painting’s major focal point, a green segmented form – fulsome and plant-like. To ensure its visual impact, Moody responds with a cool yellow convex, recalling San Clemente’s apse, accented with a sizeable ribbon of purplish mauve. This exact balancing and harmonizing of every visual element characterize Moody’s work in general and sate the viewer’s innate desire for resolution. Years of purposeful art making have trained Moody’s eye and hand to adroitly move from the study of life to its conceptual interpretation. The painting, Marketplace, depicts her encounter with an open air market -- the food stalls, the assortment of shoppers and a swiftly moving cyclist in a red coat. Fragmented forms, densely grouped and asymmetrically configured suggest an environment in motion –shifting view points, changing silhouettes, fleeting light and shadow. The titles of these works increase the breadth of context to explore. The collage, Sancta Sanctorum (Holy of Holies), derives from a modern text on Christian Rome’s sacred spaces and objects. The text’s written description of a red, wooden reliquary box, filled with stones, collected from the Holy Land, prompts Moody to reflect on “the precious” and “pilgrimage.” To what extent can this canvas act as a reliquary for collecting the precious and also record the journey of a 21st-century artist? Within the canvas’ confines, subtly rests a photograph -- its contours precisely re-shaped like the angles of a silver teapot. A closer look at this detail reveals the rare wood inlays of a period furniture piece. The “rare” sits within the uniquely crafted -- like the “holy” stones enclosed in the reliquary. Appropriately, each of the works in the Italy series has a distinct identity. The painting, Fano, originated with memories of a resort on the Adriatic. Geometric shapes recall the hull of a boat, the sail’s expanse, a pennant. Asymmetrically arranged, overlapping, with occasional transparency, the forms appear to float gently in reflective water and atmosphere. Her directional use of line enhances the sense of the momentary. Though this piece conveys immediacy, it, like the others in the series, results from careful preparatory studies, in various media. The richness of the lived experience resides within these works. Moody has so refined her understanding of the visual elements that each canvas beckons to the light and dark of each viewer’s inner life. Once engaged, the viewer does not hesitate to respond. From these personal encounters – between artist, image and viewer -- the life of these images surges and flows. You’ve seen the knock-offs: the tasteful designer art with highlights of a bright color: a red: a pink: a vibrant blue. You’ve seen familiar elements in other less urgent art: but this, Marge Moody: Selections from a Decade is the real thing. Most times, Rowe Art gallery (on the UNC – Charlotte campus) is a quiet place, and at first glance the art currently on display on the walls is quiet, too. But penetrate the surfaces, and you will find that beneath the layers of paint, collage and other media there brews a quiet storm. On view through February 18, 2000, the collages of marge Moody are executed in the style that others imitate. Studied, yet loose and expressionist: they are intellectual yet free of intellectualism. I went to see this well-disciplined elegance for two good reasons: one, for the pleasure of viewing the art: and two, I knew that Moody’s work would help me at a time when I was busily wrangling my own art inside the studio, getting ready for a show. There is a solace, a release, for artists in leaving a studio in tumult for the peace of a well-organized and coherent one-person exhibition in a gallery. By the time a series of works of art have made it to the gallery format, they have been selected, framed and hung. The hardest part – completing the work – was over long before the individual pieces were edited into the comprehensible whole that makes a good art exhibition. This exhibition showcases the work of a very good, but not very well recognized, local visual artist. Moody, a Scotswoman born in Kenya who teaches design and drawing at Winthrop University, has the true eye of a born designer, nurtured by years of practice. Her lucid, often somber and serious art, lightened by the gestural freedom that comes from a confidence achieved by this experience, has more to offer that its handsomely presented facades at first suggest. The flavor of Moody’s collages suggests the era – the 1960s – when two overlapping forces emerged in modern visual art: Pop Art projected onto abstract expressionism. In contrast to her personal ancestry, Moody’s British artistic lineage is similar to many American modernists. In Britain and America, the heady modernism of the period was laced with a strong, internalized, sense of design: a continuation perhaps of the Bauhaus rigor. While literal elements of pop Art are noticeably absent from Moody’s work – there are no labels from canned goods here – she infuses the technique of collage with the pick-up freedom of the Pop recycler. Moody’s collages don’t shout ‘Pop! Bow! Or Smash!’ in jagged zigzags written across their surfaces (or have any direct commercial reference – except for that pesky Paul Revere logo!). But neither are they simply elegant late Bauhaus design studies. The ‘pop’ element resides in the collage-making – the action of assembling the scraps and found objects, sometimes right off the street, or the studio floor. How many times can the art critic call collage “that quintessential 20th-century medium” and get away with it? For as long as artists respond to the eclectics that is our contemporary culture I suppose. Collage may also lay claim to the 21st century, too. This artist does demonstrate a partiality to American and European painters of the post-War period, most noticeably American Robert Motherwell and his generation, along with Helen Frankenthaler and the much earlier Russian Constructivists. In some ways this modest show, a mixed-media retrospective of a decade, is a textbook model of that abstract expressionist genre. While personal, the work fits into the continuing community of modernism, finding solutions that are confident, yet not premeditated. But Moody isn’t content with being just another handsome formalist artist: she forces her work into positions that allow emotions such as anger to take center stage. In her artist statement, she says, ‘Some of the work is a more direct response to life situations experienced in which I attempt to describe difficult, intangible ideas – anger, fear, sorrow – by intuitively manipulating the compositional relationships until such feelings are evident in my work’. The best and most exciting of Moody’s work conveys emotion and goes beyond mere formalism. The throbbing reds and the dramatic notes of black riding up against certain blues in several of the collages seem to reflect such strong feelings. The sense of space in an earlier piece, a larger, (40 x 54”) untitled collage from 1990, reads from a distance like interior architecture. The all-embracing modernist design ethic is at work here, linking painting, architecture and graphic design, establishing a geometric sense of depth on a flat plane. 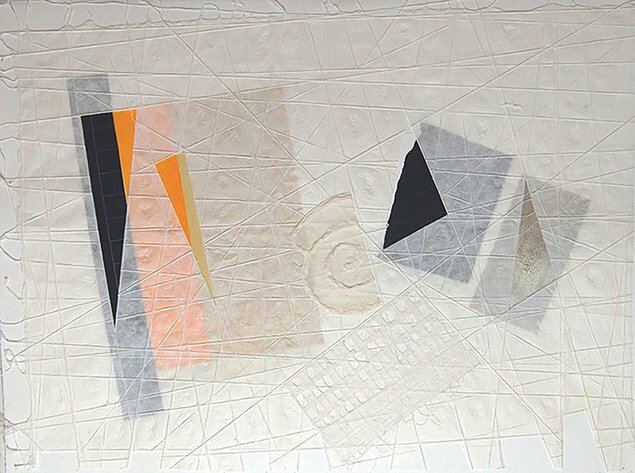 Another, entitled, Collage with Shapes (1997) is composed of large cut-out shapes transposed into a large horizontal format with bold forms and colors, recalling Motherwell’s seminal work. Throughout the show, we see large horizontals and squares, somber in color with a classic, dark constructivist style with bright highlights. Moody works in a range of sizes. In the small 20” x 20” Square Series (Pink Line), handsome rich swatches of dense ink are laid across bright white paper, combined with umber, golden ocher, and pink. Several of the larger collages use the diptych format to solve compositional dilemmas and questions of scale. Armchair warriors: Onset (1996) is one such strong, larger (40” x 56”) two-part piece. Another example, Armchair Warriors Series: Evil Eye (1997) has a strong vermillion plume against browns, blacks and grays. Another of the bigger pieces in a diptych format, Spirit Series” Four Corners, is constructed with beautiful unique papers if silver, warm gold, gold and sienna. Black rice paper scattered with gold filaments holds the composition together. This excellent show by Winthrop University Department of Art and Design professor marge Moody reveals some of the most sophisticated abstract art in the Charlotte area. It’s serious art, and while often understated, is diffused with humor and wit. What is controlled by a sense of design – what is pin-striped precision – is loosened from its bounds by the gesture and wild marks of the subconscious mind. Marge Moody: Selections from a Decade is on view at Rowe Arts gallery in the Rowe Arts Building on the UNCC campus through February 18. Gallery hours are 10 – 4 weekdays: but call ahead (547 2473) to make sure it’s unlocked. “Once radical and new, collage has outlived its modernist origins to become a widely practiced medium. Collage is particularly resonant in our pieced-together reality of urban layering, suburban strips, MTV channel surfing. Whether we are traveling electronically or in the car, the collage sensibility is open to a line of flight beyond the preconceived and anticipated into a realm of sensibility and chance associations. The work in FOUND FRAGMENTS demonstrates this ability of collage to remain open-ended and entertain a great range of approaches and imagery. The only common ground for the artists in FOUND FRAGMENTS is the medium itself. Although each artist relies on a mixture of choice, intuition and chance, they have each found a different set of concerns and solutions specific to their own situation and issues. In this, the medium of collage has lead the way for the pluralism of the contemporary art world and parallels the postmodern experience of daily life. A new exhibition in the Tower Foyer Gallery from this coming Saturday, featuring new and old work by renowned painter and Duncan of Jordanstone College graduate Marge Loudon Moody. This will be Marge's first show in Great Britain in 30 years - she has lived in the USA since 1983, and is currently a Professor in the department of Fine Arts at Winthrop University, Rock Hill, South Carolina. She graduated with a Diploma and Post-Diploma in Drawing and Painting from Duncan of Jordanstone in 1972 ( DJCAD), now part of the University of Dundee, in 1972. The exhibition features one of her student works alongside stunning abstract paintings created during in her time in the USA. Quoted from a blog by Councillor Fraser McPherson. Dundee University Review of the Arts – Written by staff and students, DURA supports independent cinema & publishing. DURA promotes diversity and supports local and regional arts. This exhibition showcases work from artist Marge Loudon Moody, who graduated from Duncan of Jordanstone College of Art (DJCAD) in 1972. She is currently Professor of Fine Arts at Winthrop University, South Carolina, having moved to the United States in 1983. Yet despite its title, the exhibition is not a retrospective in the usual sense, in that most of the works on display are recent (completed in the last 7 years) with the exception of Still Life with White Teapot, which was finished while the artist was a student in Dundee. Still Life shows a bouquet of dying flowers on a tabletop, below what appears to be a hanging pair of sausages. The painting’s simplicity and symbolic quality seems to echo the still life works from the 1970s of Peter Collins, who taught for many years at DJCAD; whilst the work is at home within the still life tradition, its allusive symbology points to the artist’s subsequent explorations of personal experience. In her more recent work, Loudon Moody borrows from an ample range of abstract painting styles to create dynamic works exploring the experience of place, all the while drawing from her own subjective imagination. The places that emerge in Loudon’s paintings are not real locations; rather, the works seem to refer to those locations as starting points for the creation of autonomous painterly spaces. The main wall of the Foyer shows seven paintings completed around 2006 and 2007. They belong to different series and as such reflect the artist’s experience of different places: her studio, her home, locations throughout Italy. The square format of most paintings imposes a structural order to the dynamic spaces contained within. Here Loudon Moody has achieved a complex evocation of space, with the shapes, lines and fields of colour receding and surfacing between front and ground, creating a spatial play that inevitably draws in the viewer. In her statement accompanying the exhibition, the artist refers to her painting process as one of looking for an “harmonious expression,” but hers is not the harmony of “quiet grandeur” that Johann Winckelmann wanted to see in classical art, nor that of British painter Ben Nicholson or American abstract lyricist Helen Frankenthaler, all three being artists whose personal experiences of place were also an impetus for their art. Loudon Moody’s paintings brim with dynamism, giving the impression that the harmony that sustains them is always on the brink of dissolving. The colours, shapes and lines are in a constant state of transition, attesting to the ephemeral quality of our experience of place. In this respect, it is relevant that the artist works in series, acknowledging that a particular place​e or experience may allow for multiple possible manifestations. The exhibition includes three paintings from Moody’s Italy Series that stand out among the rest for their vivid shades of ochre, red and yellow, suggesting an aggressivity rarely present in her other works. To my mind, these are the artist’s most experimental and suggestive paintings, differing markedly from her explorations of places such as her studio and home. This is apparent in their stylistic qualities but also in the conceptual tensions they bring into play regarding the experience of otherness; in her case, “Italy” is the generic name for that otherness, a place beyond the familiarity of studio and home. It signifies a location explored through a detached touristic gaze, which wants to capture the fleeting nature of a place in subjective experience, while disregarding its history and context. Moody’s paintings creatively engage with elements of that otherness and make it her own. In this, Marge Loudon Moody: Made in America 1983-2013 is exemplary of the difficulties we all share in negotiating this kind of otherness. This entry was posted in Art on October 30, 2013 by Gail Low. My work is inspired by my experience of places, distant, close to home, and from my imagination. Using non-representational imagery, the work describes the ‘spirit’ of place. I work thematically as each experience may suggest many possible visual outcomes. Subject matter may serve as metaphor for intangible ideas. The work examines boundaries, addresses the fragility of existence, of presence, of absence, and of memory. These paintings were stimulated by the environment of my studio at different times of the day and night. The Hanging Planes series was generated from the immediate environment of my studio, seen at different times of the day with expected changes in the light. The 'Flohs' (Olde English for 'Floes') of Lake Michigan series was begun in 2015 following a visit to Chicago, Illinois, in the early spring. Resulting work reflected my experience of seeing this phenomenon - curious shapes, fascinating, rich depths of the partially frozen water and dazzling sunlight striking unexpectedly in the far distance. This year has seen a total rework of the earlier paintings which stemmed from written notes, a few scant sketches, drawings on newsprint and my imagination. This work explores the formal aspects of asymmetrically balanced composition. It employs drawing to direct the initial activity, which may be developed at any point in the work, which serves to lay down a schematic upon which the collage elements may be built. Time to Stand and Stare series. Work made while attending an artist residency at OBRAS, Evoramonte, Portugal. purchase are also the ones who have created the most local and distinctive story landscapes’ (The article continues). The ongoing ‘Blue Chicago’ series consists of 7 abstract acrylic paintings on canvas. During my visit I became acutely aware of the color blue seen in various places - on buildings, in train stations, glimpses of daylight in dark alleys, reflected off the face of glass or of distant glowing light in the dark night sky. Each of the blues was different in tone, intensity and nuance of hue – some brilliant blue, some aqua blue green and others, dark, velvet blue. Some blues were transparent and others opaque. What they had in common was their blueness and that they appeared everywhere, at random, throughout the city. On the same visit I spent time at the Chicago Art Institute looking at the retrospective exhibition of Pop artist, Roy Lichtenstein and I became aware of how he used a certain Cerulean blue, in a particularly thick and sensuous line. Chicago is a city renowned for jazz and blues, and at the heart of its musical past is the ‘Blue Chicago’ club, still very active today. While revisiting an ‘architectural finds’ warehouse, I noticed an old, disused sign for this historic blues club hanging from the rafters. The sign had blue painted letters, rusted and fading, and over the top a thin Cerulean blue neon line of fluorescent light, spelling out the club’s name. This became central to one of the paintings. The relationship between art and music is well known. There is a strong connection between jazz and abstract art, identified in many artists’ work, particularly in that of African American artist Romare Bearden (born in Charlotte, and who lived in New York and New Orleans) who created over 100 works dedicated to jazz and music in the 1960’s and 70’s. Twentieth century master, Henri Matisse created an entire portfolio of paper cutouts which he titled ‘Jazz’, and Russian painter (and writer of the book ‘Concerning the Spiritual in Art’), Wassily Kandinsky asserted a deep relationship among the arts - particularly between music and painting and the way the two can act on the human soul. Kandinsky’s own work developed an abstract style based on rhythmic lines and harmonious color. As an artist I am of course aware of these artists and have long been an admirer of their work. It is possible that what started as a simple interest in, and observation of, the color blue and its incidental, haphazard appearance may indeed become a more focused study of the interrelationship between jazz or blues and painting, and this connection is perhaps indicative of where this series might go. The work in this show, entitled, ‘Chicago In Your Dreams’ resulted from a visit to a warehouse in Chicago, Illinois. A building over 4 floors, the warehouse contains many items randomly juxtaposed, large and small, whole and partial, some dating back to the 1920s and 1930s as well as furnishings, equipment and other structures of unidentifiable purpose from more recent decades. The place is as if one had stumbled into a dream. Objects are real; captured; immobilized and rooted in the near or distant past. They are on view, in plain sight, to anyone who visits. Yet at the same time their presence evokes a sense of history, of memory and of environments that once were; of other moments in time. Dreams may be similarly based on reality dissolving into fantasy; of the blurring of the line that separates the ‘real’ from the ‘unreal’. My work addresses finding my fine line between reality and imagination. This body of work describes allegorical situations relating to past and present experience of which we are all, inevitably, a part. It examines boundaries, addresses the fragility of existence, of presence, of absence, and of memory. It explores rich textural surfaces. Painted marks engage in conversation, while muted color promotes sentiments of quietude and of subtle states of being. The ‘Field Lines’ series began in Charleston, SC, examining random marks made on the beach by tides, winds and grasses. It later developed, although still revolving around landscape, when I took a trip to the Southwest of the US and viewed the landscape of northern Arizona from the air. This extensive series comprises many acrylic paintings of varying size, monotype/collagraph prints, editioned screen prints and mixed-media installation works. In search of describing the essential, intangible nature of a place, the ‘Thin Places’ series arose. My research ld me to a book by Tracy Blazer on the subject and one of the writings and poems of former Irish priest, John O’Donnohue, quotations from whom appear below. The Celts that inhabited Ireland in the centuries surrounding the time of Christ had a name for particular geographic locations where the physical and the spiritual came to touch each other in a special, almost tangible way. In their pagan, pantheistic spirituality, they believed there were places where the line between the spirit world and the physical world was ‘tissue-paper thin’. These pagan Celts therefore referred to and revered such sites as ‘Thin Places’. Extracted from: Tracy Blazer ‘Thin Places: An Evangelical Journey Into Celtic Christianity’. We assume too readily that we share one world with other people. It is true at the objective level that we inhabit the same physical space as other humans: the sky is, after all, the one visual constant that unites everyone’s perception of being in the world. Yet this outer world offers no access to the inner world of an individual. At a deeper level, each person is the custodian of a completely private, individual world. Your mind is the double mirror of the outer world and of your inner world. It is always actively making pictures of things. If you lost your mind, you would lose your world as well. Your mind is so precious and vulnerable because it holds your world. Thoughts are the furniture of the mind. They are the echoes and pictures that hold your world together. This is the fascinating adventure of perception. John O’Donohue: ‘Eternal Echoes’. Celtic Reflections on Our Yearning to Belong. The ‘Studio’ Series is a response to the place in which I live and work, my studio in the heart of the old town and to its location, high up, catching beautiful light and wide panoramic views. The juxtaposition of ancient and modern, red brick, elegant architecture and wrought iron are to be seen from the windows. My interest in urban landscape reappears in this series. The ‘Home’ series reflects aspects of the place in which I live, inspired by the garden and its juxtapositions of vine and leaf, brick and glass, daytime and night time, of order and rampant growth and where multi-layered images reflected in windowpanes result. The ‘New York Minutes’ series strives to capture the feeling of energy and visual stimulation always experienced whenever I visit New York City. On the occasion of a recent winter visit, colors and shapes are reflected as skyscrapers and snow clouds become one in the late afternoon twilight. The series comprises three large paintings on canvas, three watercolors and numerous very small graphite and mixed-media drawings, each of which recalls a fleeting glimpse of city life, from subway, bus or from the window of the hotel. The Italy series started in 2003 and has been developed over interim years as repeated visits to that country have inspired new ideas. Stimuli include the landscape of Tuscany and Umbria, the color of buildings in city streets and shrines and graveyards, all of which have inspired new work.